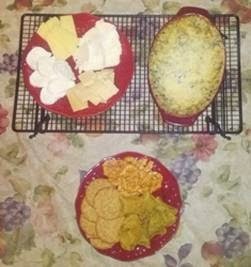 I started with an appetizer course of spinach dip and a cheese plate. I used this recipe as a base for the dip, but then used greek yogurt instead of the sour cream and mayo. I also added some additional spices. It didn’t end up quite as creamy as I’d hoped, but it was still tasty. The cheese plate was composed of fresh mozzarella, Brie, Kerry Gold Dubliner, and Prima Donna Maturo. These were paired with pretzel crisps, crackers, and Veggie Dippin’ Chips. For the meal itself, I picked up a 2 lb bag of mixed seafood. It contained scallops, shrimp, calamari, and mussels. I used this recipe, although with quite a bit more Old Bay. (maybe mine has lost its strength?) I used a regular onion and left out the snow peas. I think my seafood was not completely thawed out, so I ended up with rather a lot of liquid that I don’t think I was supposed to have. The milk part also did not thicken as much as I expected. As in, not much at all. I really debated whether to even add it or just leave it as a garlic sauce, but ended up mixing it in anyway. I am SO glad I did. 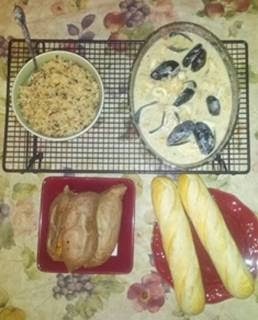 The overall flavor was amazing, and I’ll definitely be making this again! I’m sure it would have been fine on the angel hair pasta the recipe calls for, but I skipped that part and made some 7-grain medley I had. It appears that mix is no longer available for sale, which is a bummer since it was such a nice, healthy mix of grains. It also worked well to help soak up some of the delicious seafood liquid, as did the baguettes. I baked some sweet potatoes so I could have some form of vegetable and made sure to keep them just the veggie without any heavy butter, cream, or sugars added. I should have made a salad or some other type of green veggie, but I didn’t. We had plenty of food. I was not sure what kind of dessert I wanted to make. I was torn between a cheesecake and a key lime pie. I did not want to make both, since I knew we would eat both and we did not need that much dessert floating around. I found this recipe that sounded rather like a lime cheesecake. Voila! Perfect! Well, turns out not really. It was a nice, creamy, mild pie with only a hint of lime flavor. It’s nice, but I doubt I’ll make it again. It would have been better with a stronger lime flavor, which perhaps the suggested brand has. I used what I had, and was not impressed. But hey, we had some Lindor chocolates so it all worked out.